Yancy helps us manage the content on our site. We can use Yancy to easily add new To-do items to our site. To add Yancy, we use the Mojolicious::Lite plugin function. For Yancy to work, we need to configure it with our database and tell it to read our schema to build its forms. Yancy can generate its configuration from our database schema and give us a rich form to edit our data. 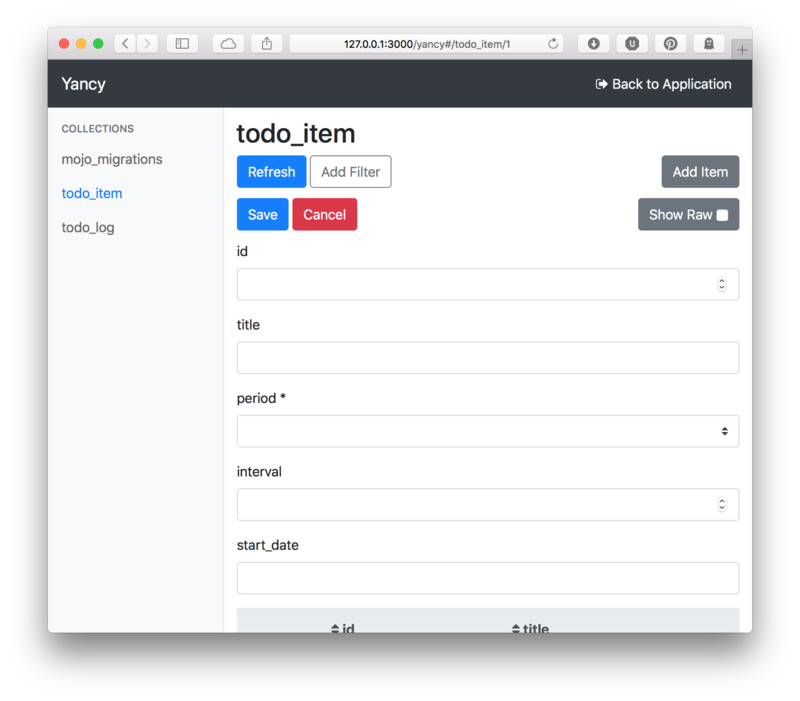 With the Yancy plugin added to our site, we can now manage our data from our website. Start the app using carton exec ./myapp.pl daemon and then navigate to http://127.0.0.1:3000/yancy to see the Yancy editor. The first thing we see is the first table alphabetically, mojo_migrations. 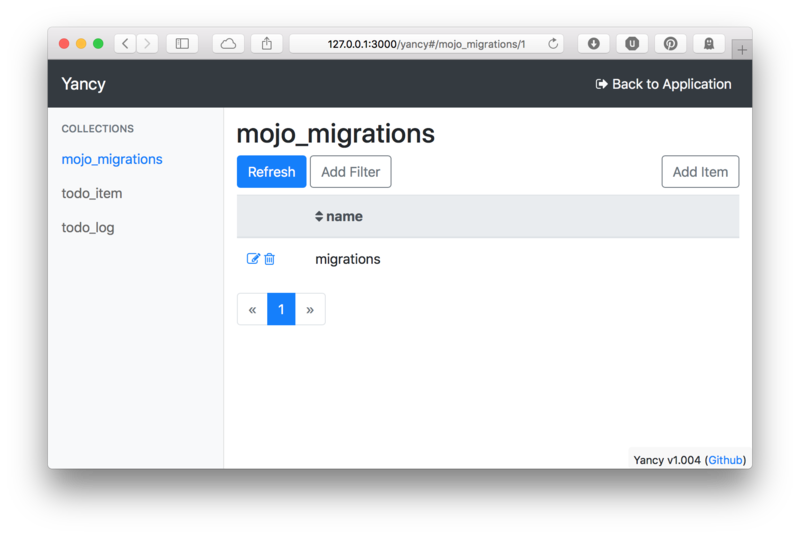 Mojo::Pg uses this to keep track of what database migrations have been applied. We don't need to use Yancy to manage this, so we'll go over how to remove this later. The left-side menu lists all of the tables we have in our database, which Yancy calls "Collections". 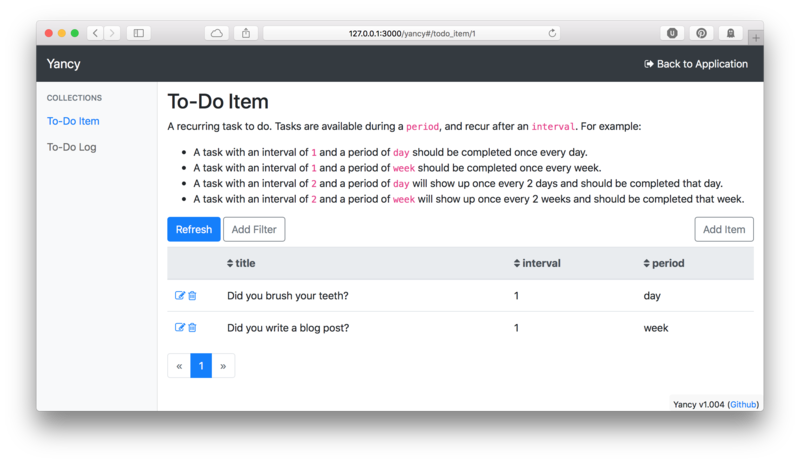 Click on the "todo_item" collection to see the todo item table, and then click on the "Add Item" button to add new rows. 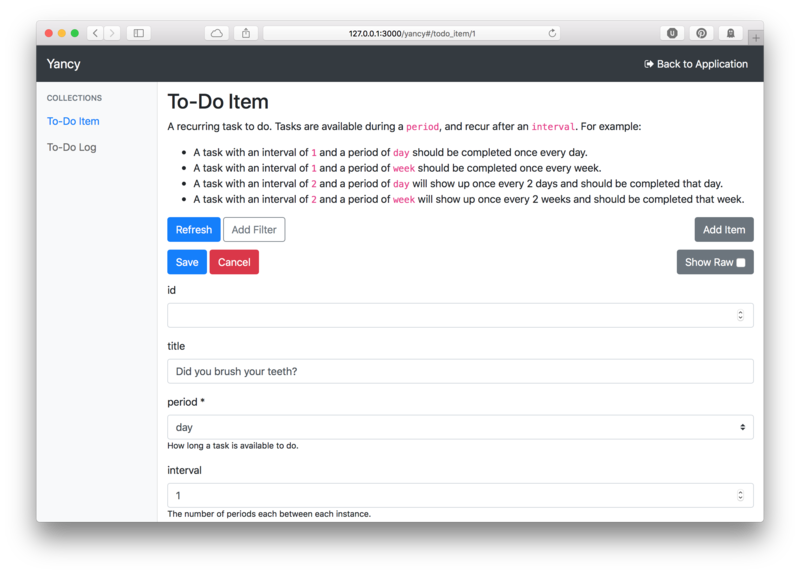 Yancy has read our database schema and produced a form to edit our todo items. The period field is a dropdown menu to select one of the three possible periods, and the interval field is a numeric input. Right now, Yancy only knows what it read from our database. We can give Yancy more information to make the forms better, adding titles, descriptions, and additional validations. Yancy configures collections using JSON schema. Each collection corresponds to a database table and describes a single row in that table. Additional, Yancy-specific fields help to control Yancy itself. These custom fields begin with a x- to prevent overlap with future JSON schema development. First, we'll remove the mojo_migrations table. We don't need Yancy to manage that. For that, we'll use the x-ignore Yancy option to tell Yancy to ignore the mojo_migrations collection. Now if we reload the editor, we'll see only the two tables we want: todo_item and todo_log. Next, we should add some friendly descriptive text to our tables to make it easier to edit them. JSON Schema allows use to annotate our collections with title and description fields. Yancy allows these fields to have Markdown, so we're using Mojo::Util's unindent and trim functions to keep our multi-line descriptions indented. Not only can we add a title and description to our collections, we can also add them to each column by declaring the column in the collection's properties field. once every 2 days and should be completed that day. once every 2 weeks and should be completed that week. After we've added some documentation to our data, we should make the list view more useful. Yancy tries to guess as to some useful fields for the list, but it's just a guess. We can display the title, interval, and period columns for the to-do items by setting 'x-list-columns' => [qw( title interval period )].